Lighting the paths and driveways in your outside area can really add some curb appeal to your home, as well as make it much easier to see! We’ve researched and reviewed a huge selection of products to bring you our solar path lights buying guide. Spruce up your garden with any of the amazing lights on this list! But before we get started, let’s take a look at some things you should know. Material: What is the light made of? The most common materials that we found were plastic and metal. Note that this only refers to the material that the light casing or decoration is made of, not the light itself. Pieces: How many lights come in the package? Some on this list only come two to a set, while others hold an incredible 12-18 lights in order to decorate your whole garden in the same type of light. Weather Resistant: You don’t want the weather to get into your lights and cause them to malfunction. 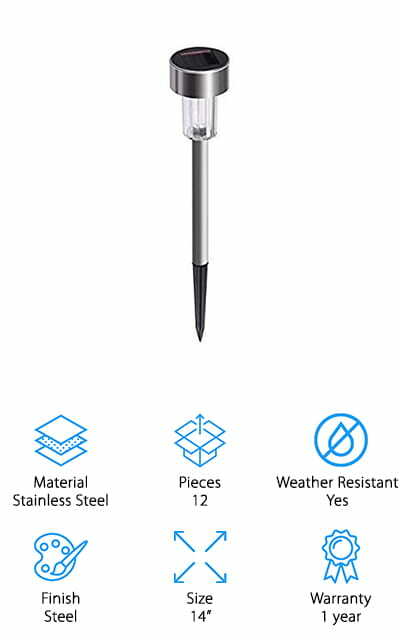 Many of the lights on our list are resistant to rain and snow, so you don’t have to worry about them. Finish: What color or texture is the light finished in? Black seems to be a pretty popular finish, with bronze or textured bronze coming in at a close second. Both add elegance and a classic style to any outdoor area. Size: The size of the light only refers to how tall it is at its full size before it’s planted in the ground. This gives you the ability to choose lights that are either closer to or farther from the ground. Warranty: The warranty protects both you and your purchase: if it stops working within the warranty period due to normal wear, you could get a refund or a replacement product. And best of all, this guarantee is free! Now that you know everything there is to know about solar path lights, we can take a look at the solar path lights reviews that we’ve compiled through a lot of research. If you’re in a hurry, check out our top pick and budget pick first, as they’re the best of the best and will give you a good idea of what’s available. Check out the rest of our list as well for great lights! 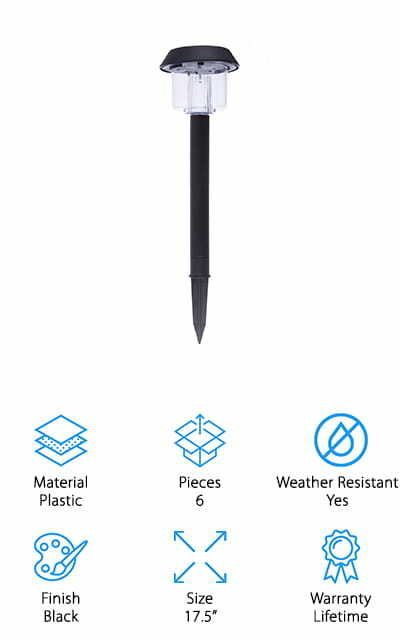 Our choice for the best solar path lights for sale are these black-finished torch-style lights by AItyvert. Easily the part that we like most about them is the flickering flame LED light that comes on when you switch the torch into the on position. They look just like real flames, without the fire hazard! It comes with a Lithium-Ion battery, but it’s only a backup power source to the solar panel on the top. For the most part, if these lights are placed in a sunny area, they will keep themselves lit at night with minimal intervention! There are four in this package, and automatically turn off and on as the day passes. And you only have to stake them into the ground for installation! The weatherproof feature is also pretty amazing, so you can keep them out all year long with rain and snow and they work! They’re perfect for garden parties and barbeques. The best cheap solar path lights that we could find are these, from URPOWER. There are two in this package, and they have separate light and solar panels in order to help them soak up the most power and illuminate a wider area. You have to have them turned on in order to charge during the day and then automatically turn on at night. They are waterproof in the rain and snow, and it only takes between four to five hours to charge them completely. After charging, they’ll work for a full 6-9 hours, which is pretty amazing! What we like most about these lights is the way that they are retracted during the day in order to soak up the most sun, and then pop up when it gets dark in order to illuminate your paths, driveways, and other areas. There are even two separate modes – high light and dim light, so you get the perfect mood every time. By far the brightest LED solar path lights are these lights by SolarGlow. When fully charged, they produce a startling 15 lumens of light each, perfectly illuminating your gardens and driveways. They’re completely solar powered, and you don’t have to do anything to get the lights to charge during the day – they are automatically charging and ready to go when night falls. They are weather resistant so no frost or rain is going to ruin them. You don’t have to worry about running out to uninstall them in a sudden rainstorm! We love that they’re completely automatic and the only thing that you have to do is plant them in the ground to light up your property. 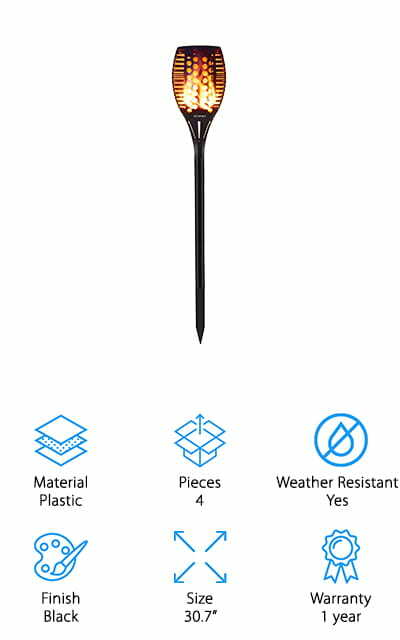 And installation isn’t that difficult – simply push the stakes into the ground, right out of the box. There’s no wiring. They also make great lights for your sunny camping trips. Save on fuel and batteries with these lights in the outdoors! These elegant solar lights by Moonrays are beautifully cast in metal, with a rubbed bronze finish that makes them perfect for any outdoor installation setting. Each of the LED lights shines 30 lumens of warm white light to whatever area you need, making sure that all of your paths and driveways are perfectly illuminated with light that’s much brighter than other lights. It can illuminate areas up to 48 inches, just from a single light! You can install them by just staking them down right out of the box, with no other complicated wiring or issues. The might be the best rated solar path lights on our list based on their design and their brightness. It’s never been easier to illuminate the areas around your home in the dark! The glass lenses give you 360 degrees of light, which is more than some other lamps can promise. We just love how bright and effective this lamp is! These stainless steel lights can be installed in your yard with absolutely no fear of rusting! In fact, you’re not going to see any water damage on these lights no matter how much it rains. That’s because the outside casing is entirely weatherproof! You can turn it on or off, or use the automatic function to make sure that it turns on when it’s dark out and off when the sun begins to rise. 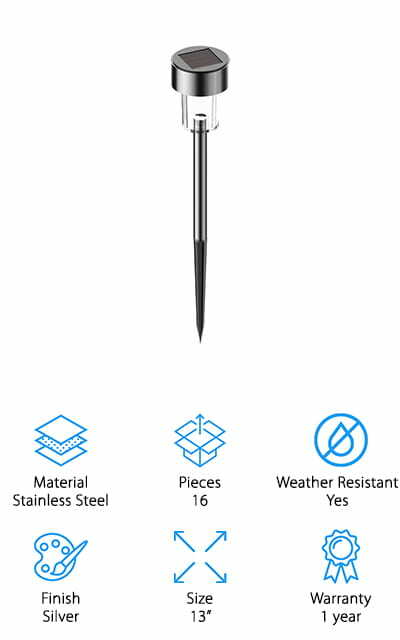 You only have to push the stakes on the ends of the lights into the ground to produce eight hours of illuminating light on a full charge. Your pathways and garden areas will never be dim again! Even your porch could benefit from these solar lights. They’re decorative and functional, and some of the best outdoor solar path lights on our list! You get 12 full lights for the price, which is an amazing deal if you ask us! We love these lights! 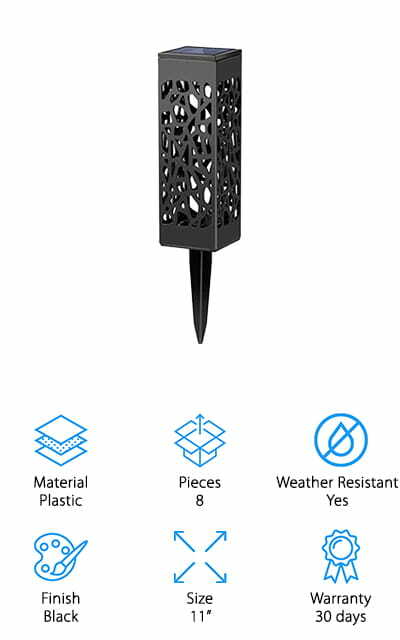 These decorative lights by Maggift are one of the best solar garden path lights we found because of their design. They look like little lanterns and cast a beautiful, atmospheric glow that will make your space look fantastic. The soft, 3-lumen light shines out from behind the plastic paneling and casts decorative, fun patterns onto the grass and sidewalk. It’s a soft light that is just sufficient enough to light the area. When placed correctly, it only takes about six hours for these lights to fully charge. There is an on and off switch under the lid of the light that you can use to put it into auto shut off mode so that it will charge during the day and come on when it gets dark. We just love the decorative design, and it’s sure to add flair and style to your garden décor. These lights will look great on either side of your driveway as well! 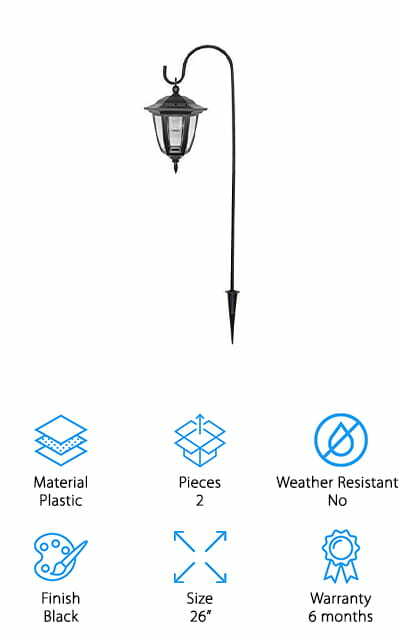 There are eight lamps in this pack of the best solar path lights by Voona. They have a standard lamp look with solar panels at the top that works to charge a battery located in the lamp. On a full day’s charge, they’re going to light your pathways, driveways, and your garden for up to eight hours – so you can get a whole night of lighting that isn’t going to cost you. They install with no wires or complicated set up – just stake them into the ground and they’re good to start absorbing some of that sun. The 6-lumen glow they provide will make finding your way after dark a breeze, while still giving your outside areas enough atmospheric light to look amazing. These high-efficiency lights are an amazing addition to your outdoor areas, wherever you need light in the dark! And if you don’t like them, you can return them in 30 days for a full refund! These SURSUN lamps are some of the best solar-powered LED path lights that we found during our research. Just turn them on and they’ll start soaking up the sun and turn on as soon as it goes down. 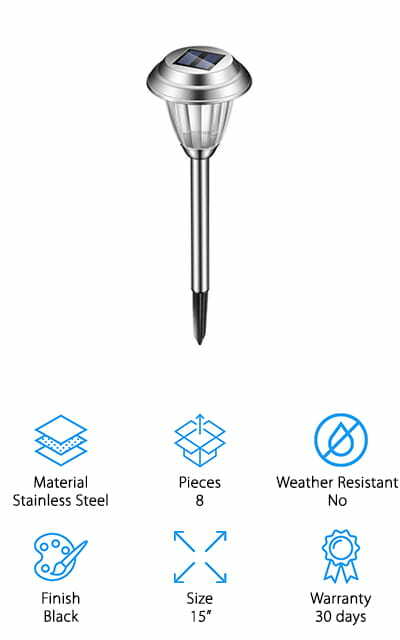 They are made of stainless steel, which is corrosion and weather resistant, so rain isn’t going to get into your lights or make them unusable. A six-hour charge can provide you with up to ten hours of light from these sixteen lamps. Did we mention that there are sixteen lamps included in this package? That’s the largest number on our list! It’s a great value. They illuminate 1.2 lumens each, just enough to see where you’re going in the dark or in the driveway. They will also add a nice glow to your garden if that’s where you choose to use them. Don’t stumble around in the dark anymore or spend money illuminating your outdoors with electric lights! These hanging lights from Maggift are probably the most unique design we’ve seen on our list. 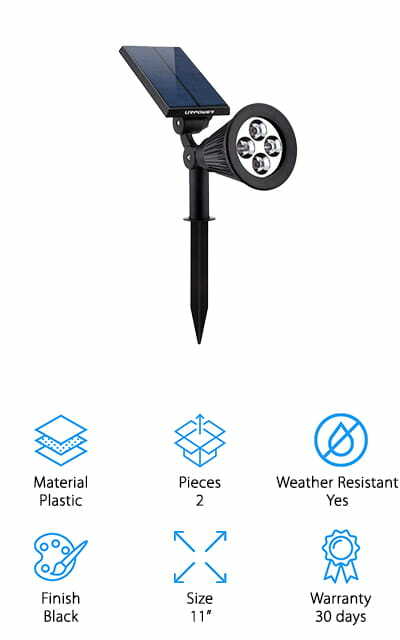 These contenders for the best solar-powered path lights hang either from stakes or from branches, which gives you a lovely style and remarkable versatility in using them. They are wireless, and only require being hung and turned on. 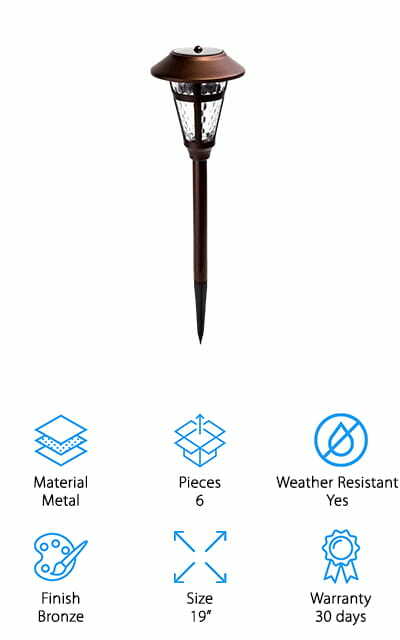 Each light comes with its own 26-inch iron stake, so you can make your garden look classic and beautiful. They emit a soft glow that will light up the area just enough to be effective and to give you the perfect look. There is an insulation trip inside the lid that must be removed before using the lamp, but after that is done they are ready to begin absorbing the sun. They’ll turn on automatically when it gets dark. We love that you can choose to hang them in your trees if you wish! GIGALUMI makes these beautifully bronzed pathway lights with textured glass around the areas where the light shines out. 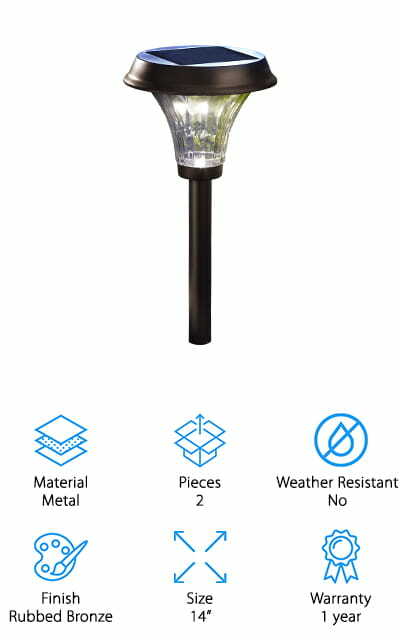 They’re super high quality and will look simply amazing in your outdoor areas, either lining your sidewalks or illuminating your garden. Just by turning the switch to the ‘on’ position, you’re enabling them to charge and turn on automatically when they sense that the sun has gone down. The ripple pattern on the glass makes for some beautiful patterns on the area around the lights when they’re on. But the design is where these lights really shine – they’re some of the best solar powered LED pathway lights for design that we were able to find. A full charge will allow them to run for 10 hours or more, which is amazing, and they are made to withstand rain and light snows without breaking a sweat. They’re also extremely bright, so if you’re looking for style and function, these are for you!